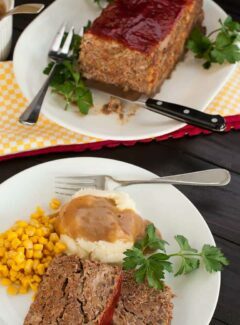 My favorite meatloaf recipe is something I thought up years ago and it has been the way I make meatloaf ever since. I made this meatloaf when I was working early mornings at the Post Office and would get home at about noon everyday. Mary Jo had banker’s hours, since she worked in a bank, and it was up to me to prepare the evening meal. For some reason I got crazy and put dijon mustard and taco sauce into the meatloaf mixture and then decided to add some richness by adding heavy cream. It was probably because I looked into the refrigerator and saw these three things and decided to use them. I’ve been using a loaf pan for making meatloaf since Mary Jo got these nice pans for baking bread. Before these pans, I remember my mom making a loaf in a 9 by 13 baking pan, forming it by hand, and that’s the way I’ve always done it. Shorter baking time is required for an open loaf so the temperature should be checked with an instant read thermometer. The bit of ketchup glaze applied about 10 minutes before you take the meatloaf out of the oven is optional, but does add some nice flavor. It’s important to let the loaf rest for at least 15 minutes so that it slices real nice without crumbling. If you’ve got young children who want to learn to cook, this meatloaf recipe is one to let them help with. They can get both hands in there and squeeze and blend, squeeze and blend to mix everything together. And you’ve probably heard about not working ground beef too much when making burgers, they’ll get tough. Well I don’t think this applies to meatloaf. Mix it as much as you’d like, then pack it well into a loaf to avoid air pockets. A simple gravy can be made to go along with the meatloaf and the instructions explain how that is done. 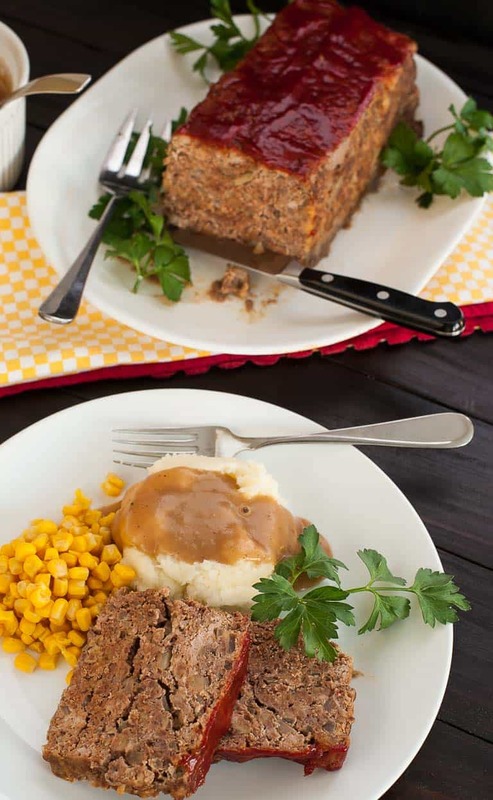 Try this meatloaf recipe and let me know what you think. 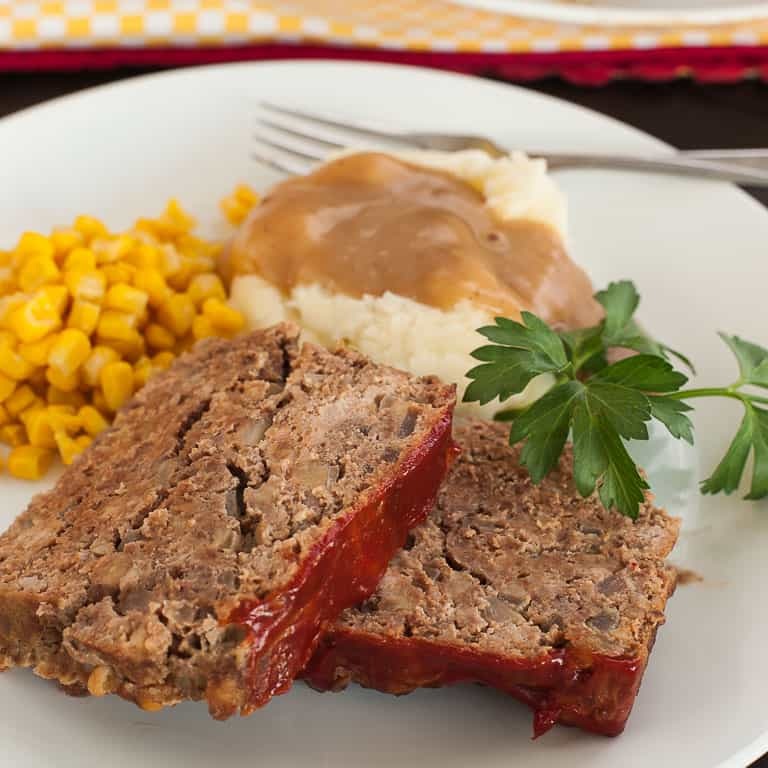 Comforting meatloaf recipe made with some unusual ingredients. Mix all the ingredients in a large bowl until fully incorporated. Pack the meat into a loaf pan that has been sprayed with cooking oil, or form into a loaf and place it into an oiled, 9 by 13 baking dish. Place into the oven for 50 to 60 minutes or until the internal temperature is 160 degrees. 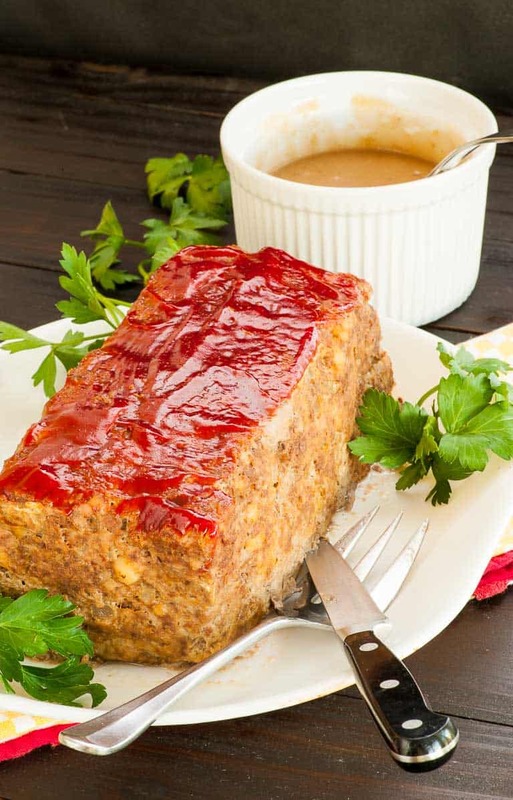 If desired, glaze the meatloaf with 1 or 2 tbsp of ketchup about 10 minutes before the loaf is done. Remove from the oven and let rest for 15 minutes before cutting to serve. To make a gravy, reserve any juices from the meatloaf. Add 3 tbsp butter to a skillet on medium, then add 3 tbsp all-purpose flour and whisk together for 1 minute. Slowly add 1 1/2 cups cold beef broth and whisk to prevent lumping. Add any meatloaf juices and stir in. Cook for several minutes to thicken if necessary. 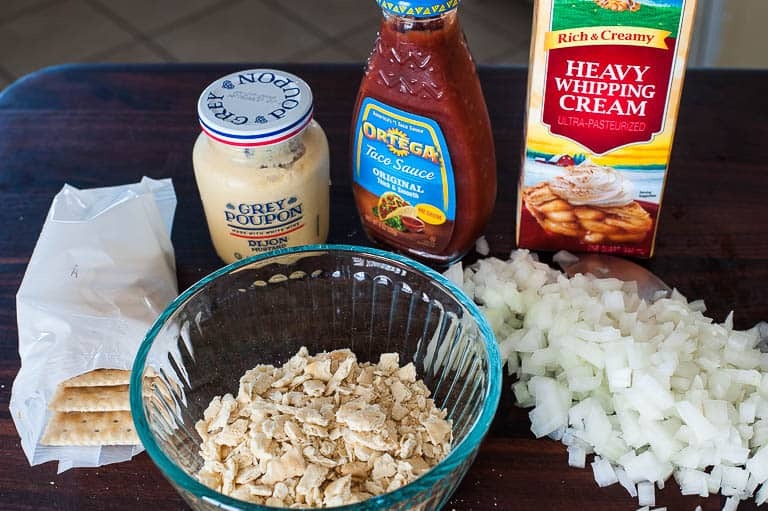 We have whipping cream left over from Thanksgiving, and always have taco sauce and Dijon mustard in the pantry so this sounds like a really good fit and good timing to try something new. Thank you Joe! This looks so good! I too have made meatloaf the same way for years so it would be fun to change things up! Thanks for sharing!! Hi Megan. Yeah, it’s a little different but tastes like a good meatloaf. Your meatloaf recipe post gave me inspiration to post my recipe. I’m anxious to try this. Can’t imagine what the flavor will be. Sounds so good. It’s good Rich, let me know what you think. I have always made Mom’s Meatloaf, but I think I will try your version. First I will have to buy Dijon mustard. Looks really good. It’s really good Sandi. Let me know what you think.